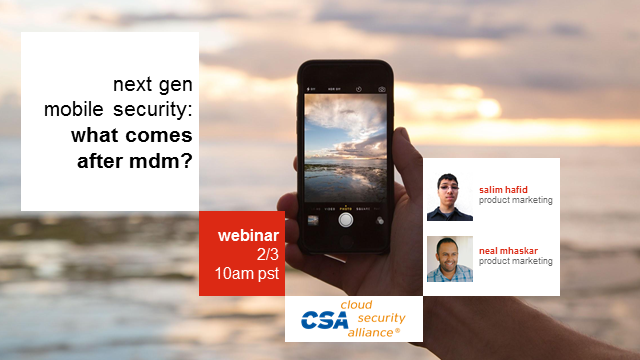 Next-Gen Mobile Security: What comes after MDM? BYOD is an adoption, not a rollout. In fact, 57% of employees refuse MAM or MDM on their personal devices. What are the drawbacks of MDM? How can your organization both drive adoption and effectively secure BYOD? In this webinar, we'll answer those questions and discuss next-generation mobile security solutions that can help secure corporate data across managed and unmanaged mobile devices. An enterprise has a diverse environment (cloud instances, servers, workstations) in which to try and detect potential security incidents. The ability of an incident response team to work quickly and at necessary scale is imperative when incidents do unfortunately occur. After an initial compromise, attackers often move laterally in an environment, trying to establish a foothold and escalate privileges. While they try to remain stealthy, they almost always leave behind footprints. Detecting and analyzing these footprints quickly and accurately to scope the issue is critical. This webcast will explore a scalable approach developed by the Adobe security team that relies on open source tools like OSQuery. The goal was to develop techniques that can be leveraged to more quickly and easily investigate large groups infrastructure components for initial triage, basic forensic analysis, and to also help proactively detect threats. Attendees will learn about the techniques we developed that they can then go apply to their own environments to help with their incident response efforts in the cloud. Nessus has been around for 21 years now and with over 109,000 vulnerabilities in its scan database, is the undisputed global standard tool for Vulnerability Management, that everyone uses, knows and loves. Nessus is a great tool but unfortunately in any medium or large organization, with Nessus alone, you will soon be buried in a mountain of unprioritised vulnerability data. Join this webinar to see how Predictive Prioritization from Tenable combines asset, vulnerability and threat intelligence data to enable you to reduce the number of vulns you need to address by up to 97%, while significantly improving your overall security. We’ve come a long way from the days of mainframe systems and a security strategy that ended at the edge of your network perimeter. Few security teams are more familiar with this evolution than those working in higher education: between research labs and large student populations bringing in a fresh wave of their own devices every year, you’ve had a front-row seat to this network metamorphosis. Penn State's Director of Identity and Access Management, Keith Brautigam, and his team are addressing these new challenges by adopting a zero-trust strategy. Duo is an integral element in that strategy, checking with each new connection whether a user and device should be allowed access. In this session with Steve Manzuik, Duo Lab’s Director of Research, they will explore how the Internet of Things (IoT) is unintentionally driving this perimeter-less movement through devices such as Industrial IoT (aka IIoT), wearables, and a unique new technology that is worth exploring for its wider implications: the hearable. Join us for an expert discussion on why the perimeter is going the way of the dinosaur, how smart security teams are adapting, and what is coming next. Much has been written and spoken about Zero Trust and the principles of “never trust, always verify” as a means for enterprises to implement effective network segmentation. As the model has been embraced, Zero Trust evolved to become a strategic Cybersecurity initiative that major enterprises align to in order to prevent successful cyberattacks. However, Is it a security buzz word or a real-world effective security strategy? Watch as Palo Alto Networks® expert and founder of Zero Trust, John Kindervag discusses the “whys and hows” of extending a Zero Trust architecture to the public and private Cloud and Rob LaMagna-Reiter, FNTS CISO, about their successful Zero Trust cloud operation, the business drivers and strategy, and the technical and cultural challenges and achievements that have quickly delivered the business results and benefits desired. In a globally connected world where the number of cloud applications consumed by organisations rises daily, the challenges associated with protecting data and individual’s privacy are therefore also on the rise. Many enterprises have inadvertently exposed proprietary information by failing to properly secure data stored in public cloud environments like Amazon Web Services, Microsoft Azure and Google Cloud Platform. While cloud computing has made it simple to spin up a new server without waiting for IT, this can also be a security nightmare. A simple misconfiguration or human error can compromise the security of your organization's entire cloud environment. Furthermore, "Cloud as an Attack vector"-based threats are increasingly breeding in IaaS, PaaS and SaaS environments to compound organizational risk. Good security hygiene should always be an integral part of any public- or multi-cloud environment, however, this isn’t the reality for many organizations. Join Netskope for a lively session in which you’ll learn about some common cloud threats and security mistakes made by SecOps and CloudOps admins and how to avoid them. - How to follow best practices and maintain continuous compliance in your clouds. This webinar will take a case study approach to demonstrate how security ratings can be leveraged to gain insight the cyber risk governance of organisations. Are organisations working in a structured manner to address cyber risk or are they purely reaction driven? We will look at organisations that have been breached in the last 12 months and explore what insights we can gather from trending across multiple security domains, including network security, DNS health, patching cadence, application security and endpoint security. We will explore how security ratings can help us take proactive measures to help mitigate risk to ourselves or our supply chain and collectively apply better and more disciplined governance. IaaS/PaaS providers like AWS, Azure, and GCP are increasing the productivity of our developers-- making our organizations extraordinarily agile. That same agility must be matched with security and compliance measures of the same speed and scale. The vast majority of cloud security threats are from misconfigured IaaS instances, compromised accounts, and insider threats but there's emerging threats on the rise as well. And you’ll need deep visibility into your workloads and containers to fight back. New privacy regulations like GDPR and CCPA make finding and protecting personal information more critical than ever. This means being able to identify both PII and contextual PI by person at scale. This Webinar featuring BigID’s Head of Product and AWS's Leader of Security and Compliance Solution Architecture will examine best practices for finding, protecting and automating PI/PII-centric privacy tasks at scale. Cloud computing offers massive scalability, availability and low-cost services as major benefits, but as with most new technologies, it introduces new risks. Because there is so much opportunity in the cloud, the cloud service provider network is continuously growing. Service providers are using different technologies, different standards, and like all companies have different competency levels. A couple of the major challenges organizations have when using cloud computing is managing these third-party operational and security risks. As more technology is moved from your company’s infrastructure to cloud, understanding and management of these risks often overwhelms technology and procurement teams. This can be managed if an effective third-party framework is put into place, appropriately managed and cross-organizational guidelines are being followed. As a leader in their industry, MGM is transforming into a digital business by aggressively adopting the cloud. Hear how MGM is protecting their enterprise data across the whole spectrum of their evolving infrastructure, from on-prem, to the device, to their SaaS, IaaS and PaaS cloud instances. Large enterprises are rethinking technology and data to build a platform for the future and cloud is at the center of this transformation. During this session we will discuss key drivers for cloud adoption, regulatory landscape, building effective controls and solutions, and the cloud journey for large organizations. Managing vendor risk is a continuous effort under GDPR, California CCPA and other global regulations. As organizations continue to improve their privacy and security programs, streamlining 3rd and 4th party vendor risk has become a priority. This includes everything from filling out vendor assessments, such as the CSA CAIQ, getting sufficient guarantees from your vendors to efficiently working with them during an audit or incident and much more. In this session, you’ll learn how to implement successful vendor risk processes, expedite vendor onboarding, and hear practical advice to automate vendor risk management within a software technology platform. In a digital world, you can’t trust everything you see. While the digital transformation has created countless benefits for enterprises, it has also made it possible to easily disguise reality, increasing the difficulty and complexity of security. Authenticating users and controlling access to critical workloads is challenging, due to the many vulnerabilities that only require network access, and security systems that neglect a key component: context. In this session, Cyxtera VP of Products and Co-Chair of the CSA Software Defined Perimeter Working Group discusses shortcomings with current authentication and authorization protocols, requirements for a consistent and effective security model, and portrays a way forward with a dynamic, context- based security solution. Security is a top priority for e-commerce giant Shopify, with over 800,000 businesses in 175 countries trusting them to sell online and everywhere in the world. Join Shopify's Vice President of Security Engineering and IT, Andrew Dunbar and HackerOne as they discuss best practices for testing and securing your cloud-based web applications. The session will also cover how you can scale application security for high-growth DevOps organizations and the tools and programs Shopify relies on to reduce security risk. Ninety-one percent of organizations in a recent TechValidate survey say they have seen phishing attacks on their organization in the past year. What’s more, 42% report more than 10 phishing attacks on their network in that time. What can be done to reduce these risks and protect your data and users? Phishing simulation tools are a powerful way to see how many and which employees are prone to fall for phishing attacks. With this information in hand, you can determine how to train those who are susceptible to avoid these attempts, and provide the tools to protect against them. In this webinar you'll hear from Steve Edwards, who manages Duo's Corporate Security Engineering team, on his experience conducting internal phishing campaigns at education and tech organizations. In addition to interesting metrics and appropriate techniques that come from phishing simulations, Steve has 10 valuable lessons to share. Join us on February 7 for this webinar to learn several unexpected things about phishing, your company, and human psychology. Expecting your (relatively) small staff of security specialists we all have to handle security, risk management, and good governance entirely on their own is a recipe for disaster. While specialists are critical to ensuring products and processes are designed well, promote security, and ease compliance, real security and good governance requires dissemination of knowledge throughout the organization. To truly understand what you are securing, and who does that work, you have to play in their sandbox, integrate into their existing processes, remove overhead wherever possible, and gather that data, data, data… did I mention the data? To scale, push knowledge and requirements downstream as much as possible, in the language your teams can use. Please join us on the 17th of January as Jasson Casey, CTO at SecurityScorecard, describes the state of cybersecurity in the modern world, and what best practices are for measuring it - differently. He will discuss the importance of behavioral analytics, and how to make use of an “outside-in approach” when measuring cybersecurity. He will relate how to apply security analytics to different facets of our business, including devops. With 20 years in the industry, Jasson will discuss his perspective on what tactics work, and which do not. Please join us to learn more. In this webinar, we will deep dive into managing the vendor lifecycle under the GDPR, California Privacy (CCPA), and other global regulations. As organizations continue to improve their privacy and security programs, streamlining third-and fourth-party vendor risk has become a priority. This includes everything from filling out vendor assessments like the CSA Consensus Assessments Initiative Questionnaire (CAIQ), gaining sufficient guarantees from your vendors, to efficiently working with them during an audit or incident and much more. Together, the Cloud Security Alliance (CSA) and OneTrust launched a free Vendor Risk Management (VRM) tool to automate the vendor risk lifecycle for compliance with global privacy and security frameworks. Learn how to implement CSA-OneTrust Vendor Risk Management (VRM) tool to create successful vendor risk processes, expedite vendor onboarding with built in assessments, and hear practical advice on how to automate vendor risk within a software platform, all while meeting legal compliance obligations. Educational series on cloud computing, security and privacy. CSA CloudBytes was launched as a webinar series to help us educate the industry on all matters related to the cloud. Our channel is designed to inform our audience about trending topics, new technologies, and latest research. It also allows audience members the opportunity to earn (ISC)2 CPE Credits. Title: Next-Gen Mobile Security: What comes after MDM?